Join us for the 5th Annual Youth Prayer Rally on the National Day of Prayer. 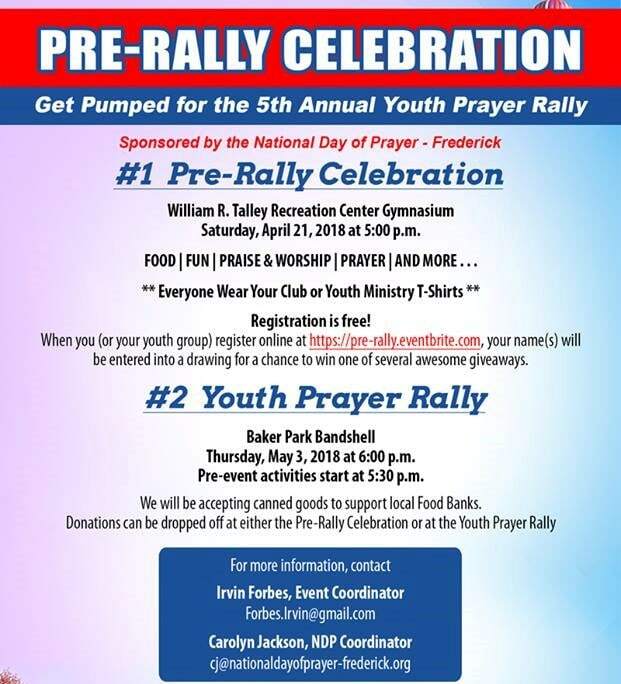 Youth For Christ partners with NDPFrederick to observe the National Day of Prayer with this prayer rally filled with praise and worship! Join us at the Baker Park Bandshell at 6pm! We will be collecting canned goods to support local food banks- you can bring your donations to either the Youth Prayer Rally or our Pre-Rally Celebration! Our Pre-Rally Celebration will be on Saturday April 21 at 5:00pm at the Rec Center Gym. You can register (free) online to attend the pre-Rally Celebration at https://pre-rally.eventbrite.com/ -- your name will be entered into a drawing for a chance to win one of several awesome giveaways.